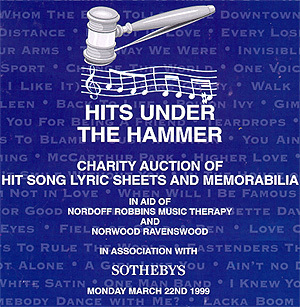 Keith Reid's specially-transcribed words are one of the featured items in a large charity auction to be held in London on 22 March 1999: full details below. It's one of fifty-nine choice items that merits a photograph in the catalogue: a further 137 are unillustrated and are available only on-line here. Subheaded '(inc "famous" missing third verse)' the manuscript is expected to realize between four and six hundred pounds in aid of Music Therapy. Imagine what it would fetch if it included the famous missing fourth verse? Enthusiasts will be intrigued to read the words 'They might've just as well been closed' on the scan above (best quality we can manage from the photo in the catalogue (12.50 pounds from Virgin Records, no expense too great for BtP!)). This is not what Gary Brooker sings on the famous recording, nor is it the same as the text Keith sent to this website as part of his authoritative deposition in early 1998: there he wrote 'They might have just as well've been closed', the word 'have' inserted, in biro, on the typescript supplied to him by BtP. In this connection, notice how the last two letters of the word 'might've' have been inserted as an afterthought in the scan above. So - does anybody still believe in the idea of Definitive Words for a song? The variation above surely heaps further fuel on the pyre. Norwood Ravenswood's mission is to build a better future for disadvantaged children, young adults and people of all ages with learning disabilities, mental handicap and offer support for their families. A commitment to reach more people in need, and to developing new services, where ever they may be needed is just part of the ethos. A belief that people who are disadvantaged or have a disability have a right to be supported in pursuit of personal growth and development. A fully comprehensive range of caring services is offered including: Community Services Social Work and Counselling, a range of support services for children, dealing with abuse, financial hardship and family breakdown and providing services for people with disabilities and their families. Residential Care Ravenswood Village in Berkshire is a thriving community which provides residential care for 179 children and adults. Group Homes and Adolescence Unit. The group homes offer differing levels of support appropriate to each resident. Whilst the adolescent unit is for vulnerable teenagers who are unable to live at home. Education is developed through an independent school and a multi-disciplined education service which aim to help children achieve their potential. Various other services are offered including Respite Care for children with severe learning disabilities. Day Services offering training, educational and recreational activities. Fostering and Adoption, Vocational Training for the catering and horticultural industries. A wide ranging organisation aiming to help other less fortunate. There are many different approaches to music therapy. We use a creative approach, where therapeutic changes are worked for within music itself. Therapists create a very personal environment which is developed, built on a relationship of trust and respect, where the client / child is valued for what they can do, and s encouraged to express themselves within the language of music. From this starting point, client and therapist work together towards overcoming the limitations imposed by the client/child's disturbance or special needs, and strive towards realising their potential within the limits of that handicapping condition or disability. Music is an intrinsic part of all of us; pulse and rhythm are found in our heartbeat, our breathing; melody is created in our laughing, crying, screaming, singing; the whole range of our emotions is held within the structures of harmony, and of musical style and idiom. These intimate connections with music remain despite handicap or illness and are not dependent on a musical training or background. Because of this, music therapy has helped children and adults with a wide range of needs, arising from such varied causes as learning difficulties and handicaps, mental and physical illnesses and physical and sexual abuse, amongst others.